This blood pressure chart can help you monitor your blood pressure levels. It shows high low and normal blood pressure for adults Blood pressure. The chart lets you keep track of your blood pressure and take the necessary measures to maintain, increase or decrease the pressure levels. Use an automatic blood pressure monitor, you can get your blood pressure reading. Draw a line from your systolic pressure to your diastolic pressure on the chart above.The blood pressure chart helps you find out whether your blood pressure is within the normal range. 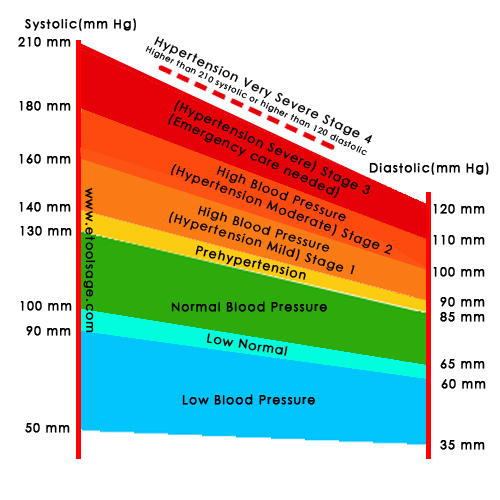 The chart also shows ranges of blood pressure numbers for low blood pressure, prehypertension, stage 1 hypertension,stage 2,stage 3 and stage 4.If your BP reading stay above normal most of the time, you're at risk for health problems.High blood pressure means your heart has to work extra hard to pump blood. It increases the risk of coronary artery disease.High blood pressure can be an important contributing factor to heart attack. High blood pressure also increases the risk for stroke, congestive heart failure, kidney disease, and blindness. Blood pressure lowers as you sleep and rises when you wake up. Blood pressure also rises when you're excited, nervous, or active.